Elias C. Boudinot (1835-1890), Cherokee Indian leader who helped his uncle Stand Watie to organize the Cherokee Indian Regiment for the Confederate Army. Also represented the Southern Cherokees in the Confederate Congress. Autograph Letter Signed, 1 page, 8vo., House of Representatives, Jan. 4, 1863 to (Rev. 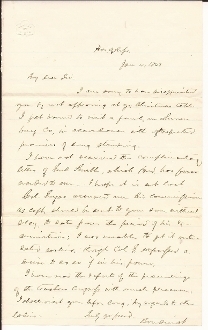 Abner J. Leavenworth) pertaining to commission for his son (Frederick Peabody Leavenworth). Part of Boudinot-Leavenworth correspondence. Part of family for whom Ft. Leavenworth was named. Very Fine. For full transcription, please see the scan.